The first ever partner for CentraLine, Clarkson Controls, has just provided the installation and commissioning of a full CentraLine by Honeywell Hawk building management system at the new Chaddesley Corbett Endowed Primary School. Set in rural Worcestershire, the new primary school, built to replace the existing one are located about two miles away from each other. 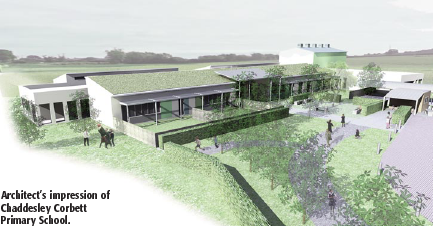 The single-storey primary school includes four junior classrooms, three infant classrooms, a nursery, dedicated music room, state-of-the-art food science/design and technology room, large hall, reception and staff rooms and offices. Clarkson Controls installed a new building-management system to the school, including the Honeywell AX Arena front-end supervisor package, providing a full graphics package with alarm management and logging capabilities. There are also different levels of user access provided when viewing system status graphics, through to full engineering access using a programmable password facility. Chosen for its capabilities in utilising both BACnet and LON communication, the Honeywell Hawk controls are expandable for future inclusion, allowing the proposed swimming pool adjacent to the energy centre to be included. control is controlled by Csquared (C²) BACnet CO2 and temperature room units. The control of the natural vent is distributed in the field using BACnet technology, and the kitchen and other ancillary control items utilise distributed Honeywell LON I/O modules. Within the energy centre, a purpose-built HVAC control panel is provided. The panel contains a CentraLine Hawk 250 Series controller with CLIOL modules to suit the application. A full colour eight inch panel PC is installed on the control panel controls section door to provide local access to the system with a full graphical interface so all plant status can be viewed in the energy centre. connected to the main Hawk controller in the energy centre using a LON communications bus. Throughout the school, natural ventilation is used to maintain air quality and provide free cooling when necessary. C² intelligent BACnet temperature and CO room units (iCRU) provide modulating control to the high-level windows, and low level louvres, while louvre reheat coils locally in each zone. The iCRU have built in 0 to 10 V control outputs and are controlled by the central Hawk controller using BACnet technology. Each device has override push buttons to allow the user to temporarily override the vents open or closed. The system then reverts to automatic control after a preset time to prevent the system being overridden indefinitely. A ‘traffic light’ array of LEDs provides a visual indication to room occupants of CO levels. unit (iDAU) to alert the school of any alarms going off within the building. New Gurdwara Sahib (Sikh Temple) Leamington Spa.